It is our hope and expectation that the Dumbarton Oaks Gardens may in time attain as high a standing in the study of, and for its publications on, Garden Design and Ornament as the Dumbarton Oaks Research Library and Collection has already attained for its scholarly work and research. Thus will the unusual potentialities of its Gardens be fully realized. Mrs. Farrand writes that she feels the cool house is too small, even for a start of what the Dumbarton Oaks Garden Centre ought to become. However, as I see no other suitable place, and as building is out of the question for a few years, and as for every reason—Harvard psychology, founders’ age, economic conditions, etc.—I think it would be better to start, get the centre running and able to prove its usefulness. Later a more spacious and suitable centre can be constructed. In the second half of the 1950s, things began to change. In 1956, the first true landscape architecture fellow, Ralph E. Griswold, was appointed, thereby initiating a scholarly fellowship program in garden design and garden history. In early 1957, a new advisory committee was appointed, and this committee recommended establishing three categories of fellowships: a senior research fellowship in landscape architecture (for a “mature professional landscape architecture”), a junior research fellowship (for a recent graduate), and garden scholarships (for “possibly two or more undergraduate students”). 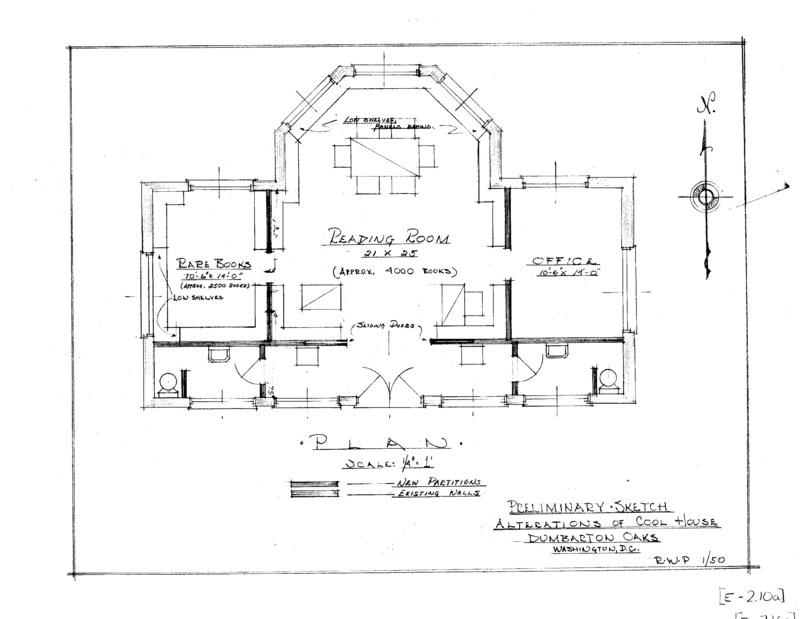 In 1958, the Blisses and the institution began discussions on a new museum wing, to accommodate just about everything that at the time had not yet found permanent housing: the Robert Woods Bliss Collection of Pre-Columbian Art and its library, the Byzantine coins and seals collections, Antioch mosaics which were in storage, and the landscape architecture rare book collection and garden library. Through the Blisses’ patronage, Dumbarton Oaks commissioned Philip Johnson to design this addition, which was slated to be built where the Rare Book Collection presently is located. His building was envisioned as twice the size of the structure he eventually built in the Copse. The Blisses admired the modern design and, as Mildred Bliss put it, were “ready to try something new;” however a domed glass pavilion essentially in the front yard of the Main House was too radical a departure for them to countenance. They therefore decided to construct two new additions, putting the Pre-Columbian Collection and coins and seals in a reduced-scale Johnson building somewhat out of sight. Thus was born the Garden Library and its eighteenth-century style Rare Book Reading Room, designed by the more conservative Frederic Rhinelander King. With this addition, the landscape architecture center was brought indoors. Fellowships were awarded exclusively to professionals in Landscape Architecture. However, the number of applicants from the practical side was never very great, and in recent years the Fellowships have been awarded to persons in related fields who have a scholarly or historical interest in garden and landscape architecture. . . . Thus the profession of Landscape Architecture does not appear at this time to be a very promising source of candidates for Fellowships. 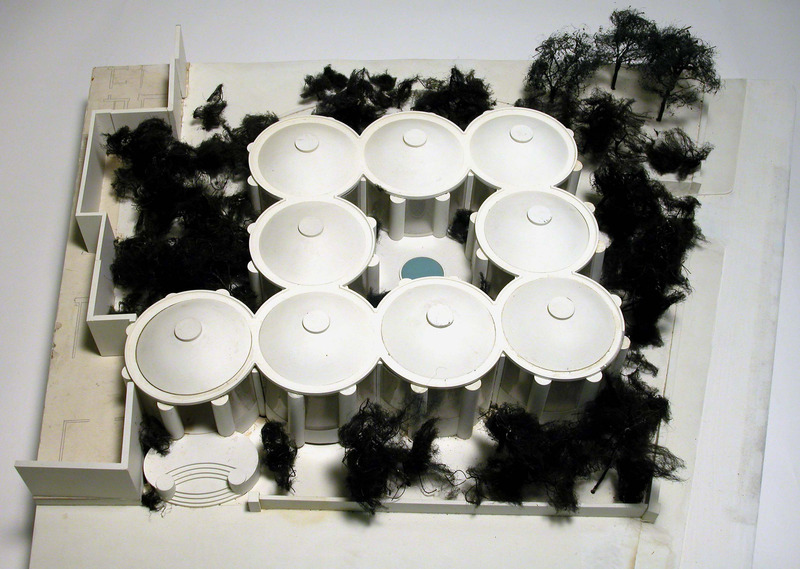 They therefore recommended that the library be headed by a scholar who “could direct the building of the collection and also find qualified candidates for the Fellowship program.” In 1971, the program held its first annual landscape architectural symposium, “The Italian Garden,” chaired by David Coffin. And in 1972, a studies program in Garden and Landscape Architecture was officially inaugurated, and Elisabeth Blair MacDougall was appointed the first director of the program; she remained in that position for the next sixteen years. The Studies in Garden and Landscape Architecture program had evolved from the praxis-oriented gardening focus to a scholarly program concerned with the history of garden design. As stated in the minutes of the Garden Advisory Committee meeting of January 9, 1973: “The research program should emphasize the study of the history of landscape architecture and the history of horticulture.” The Garden Advisory Committee was dissolved in 1974 and replaced by the Senior Fellows Committee in 1975. In the late 1970s, under the directorship of Giles Constable, Dumbarton Oaks standardized its fellowships for all of its studies programs—Byzantine, Pre-Columbian, and Garden and Landscape. Under the new structure, fellowships, junior fellowships, and summer fellowships were to be granted, and this system continues to the present day.